Artificial Intelligence as a Service (AIaaS) is the third party offering of artificial intelligence (AI) outsourcing. AI as a service allows individuals and companies to experiment with AI for various purposes without large initial investment and with lower risk. Experimentation can allow the sampling of multiple public cloud platforms to test different machine learning algorithms. We designed this expert guide to help you better understand all of the considerations for building and maintaining the infrastructure and engine that support the initiatives. Plus, learn about the products and players, like Amazon, Google, IBM, and 16 more to help you make the best buying decision. Different AI provider platforms offer a number of styles of machine learning and AI. These variations can be more or less suited to an organization's AI needs since organizations need to evaluate features and pricing to see what works for them. Cloud AI service providers can offer the specialized hardware needed for some AI tasks, like GPU based processing for intensive workloads. 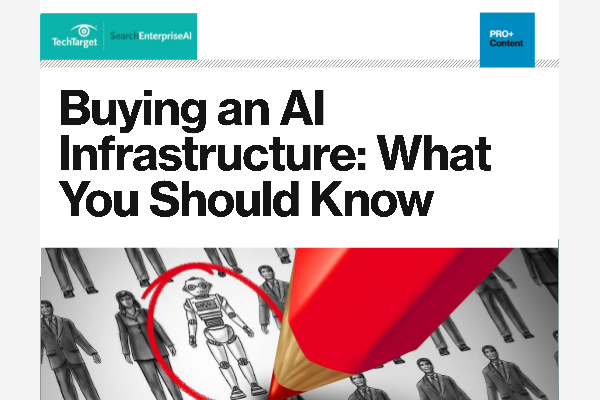 Purchasing the required hardware and software to start on-premise cloud AI is costly. Coupled with staffing and maintenance costs, as well as hardware changes for different tasks, makes AIaaS cost prohibitive to many organizations. AI cloud offerings including Amazon Machine Learning, Microsoft Cognitive Services and Google Cloud Machine Learning can help organizations what might be possible with their data. Having the opportunity to try the algorithms and services of different providers can allow businesses to find what works and allows for scaling before committing. When something is found that scales to requirements, the resources of these large providers are there to back up the scaling with compute capacity. How would you use cloud-based services with built-in AI and machine learning?